Living in Wisconsin it is hard to get anywhere without driving past a farm or two. I have not lived on a farm myself but I know several people that do. Last summer I really enjoyed attending our county fair to watch kids of all ages show their calves and cows. They are much bigger than you think when you see them up close and they can also give those kids a workout when they are trying to lead them around for judging. When I was covering our copy of Michael Perry’s new book, The Jesus Cow, I was very intrigued so I had to read it. I was hooked from the first page! Farmer, Harley Jackson, discovers on Christmas Eve that his newborn calf has an image of Jesus on his flank. Harley’s only response is, “Well, that’s trouble.” As you continue to read this delightful and funny tale, you will see just how much trouble this situation will bring to Harley and the small town he lives in. I really enjoyed this book for the humor and the cast of characters that create this novel. I could see pieces of other small town farmers I know and I could relate to how daily life was described in this Wisconsin setting. 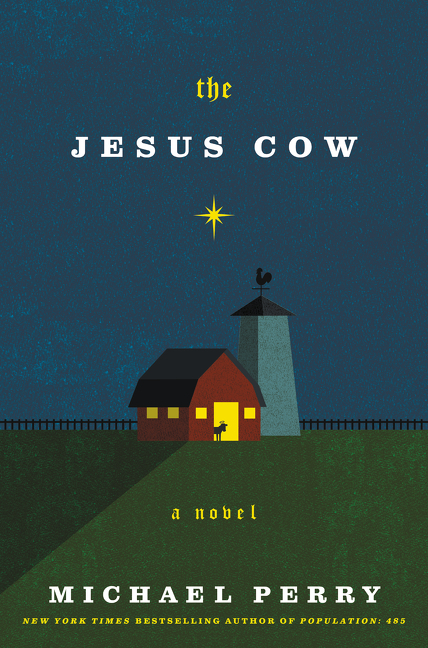 If you are looking for a humorous and heartwarming story, I definitely recommend The Jesus Cow! Also, if you are a fan of Michael Perry, you will be happy to know that The Friends of the Library will be hosting an event with Michael on October 17th. Watch for additional information posted in the library and on the library’s website www.fortlibrary.org as the date approaches for this event.